This casual, natural movement wavy style is gorgeously emphasised by the beautifully blended colours. 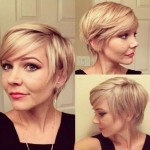 This is a lovely style for anyone growing their hair from a short cut or going shorter from a loose, long haircut! It’s full of personality and offers something a little different from the ordinary. Emma Roberts is currently wearing a similar loosely-waved hairdo. This medium A-line bob is cut cover the neck at the back, graduating down to hang in flirty separated strands an inch or two below the chin. The whole look is casual and natural with rich colours added to accentuate the movement and complement the simply shape. Rich mahogany, highlighted with honey-caramel shades, is a new and fabulous combination for the coming spring! On hair that’s naturally straight, you can easily get these random waves using heat tongs or bendy rollers and swap between straight and smooth styling and these young-looking soft waves! This cut is great for medium and fine hair as the waves add volume and the colours make hair look thicker! Find latest short hairstyles from Hairstyles Weekly!